The Irish college of Psychiatry’s “Suicide Note”. 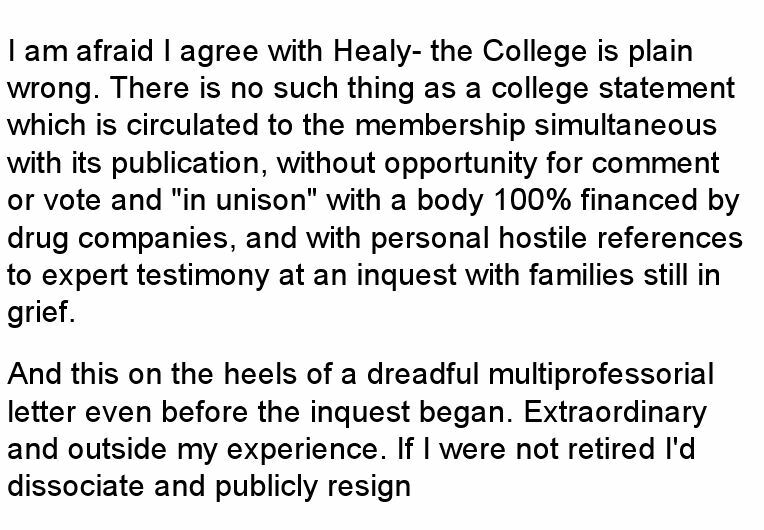 The Irish College of Psychiatry’s Suicide Note. Yesterday myself and Tony were in Cork at a conference entitled “Mad Medicine: Do conflicts of interest drive you crazy?” Programme. Among the many contributors and speakers was Professor David Healy, who spoke about antidepressants being the most commonly prescribed drug in pregnancy, despite the fact that they double the risk of miscarriage, double the risk of birth defects and possibly lead to autism or mental handicap in children born on them. 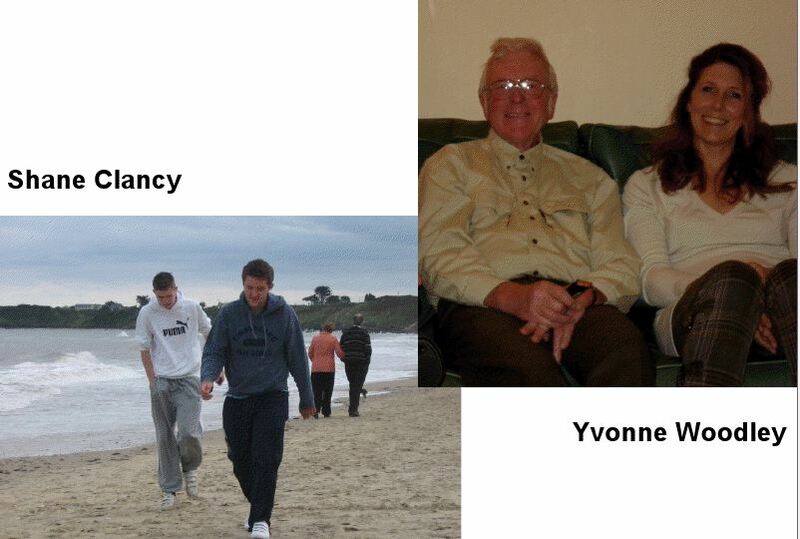 He then went on to talk about Shane’s Inquest and the case of Yvonne Woodley. Both Yvonne and Shane were prescribed Lundbeck’s Citalopram and both my family and Yvonne’s family blamed the side-effects of this medication for their deaths. He went on to explain that the Irish College of Psychiatry who through their involvement in Shane’s case, in his opinion, had written their own Suicide Note. Professor Healy’s talk…. Pictures from his presentation. Referring to Shane, this is what he said…. There was a campaign organised by the Irish College of Psychiatry before his inquest, and during his inquest and after his Inquest to say that these drugs can cause no problem at all. The jury at the inquest, a bunch of average people from rural Ireland faced with the evidence came to the view that it was clear that the drug had an effect on him and they refused to say that this was a normal suicide and normal homicide. They opened up the door to a drug induced problem. This is a response from a retired senior academic here in Ireland about the Irish Colleges (of psychiatry) efforts to say these drugs cause no problem at all. “People have been approached linked to the case, who were told that the views that they offered that the drugs could cause a problem were damaging Irish Psychiatry”. This, I think, is a suicide Note, I’ll explain now in a moment, I just want to tell you why. The Yvonne Woodley case, for example, one more thing, in this the Coroner asks the company doctor… Can your drug (which was the same drug that Shane had been on) CAN it cause people to commit suicide? and of course the company is legally obliged to say YES. Asked, Did it cause this person to commit suicide they’ll say NO, they’ll offer you hundreds of reasons why not. But pinned down on “Can the drug cause people to commit suicide?” They have to answer YES. The way around this is to defer that kind of question to professors of psychiatry here in Ireland or for others (adverse effects) professors of medicine here in Ireland or in other countries, who… THEY can say that the drugs do not cause people to commit suicide. The company is legally obliged to say it does, but academics don’t have to! So when the issue about drugs causing children to become suicidal blew up in the States in 2004, the American Psychiatric association said that “we believe antidepressants save lives”, this is a professional suicide note, equivalent to what the Irish College of Psychiatry have probably just done. What they should have said was this… “That we psychiatrists are experts in dealing with tricky problems with dangerous drugs”. John Mc’Carty was as brilliant as always. Noel Wathion from the EMA (European Medicine’s Agency) was one of the speakers at the conference but the IMB (Irish Medicines Board) although invited, politely declined. Timothy Dinan who is head of Psychiatry in UCC wasn’t there either and declined an offer to distribute leaflets to his students. I would have though that this conference would be of huge importance to both the IMB and the head of Psychiatry of UCC (the same college where the conference was held). Previous postMary McAleese and Lundbeck again. Next postAudio of Lundbeck meeting. What did Wathion have to say for himself? No surprise the IMB didn’t show or that Dinan refused to hand out leaflets to his students. That’s similar to what Dr. Healy said in his presentation at CASPER in New Zealand. Psychiatrists should acknowledge that psychotropic drugs are dangerous and that we need psychiatrists to manage these risks. Personally, I think the world would be better off without antidepressants and antipsychotics. It’s too bad all psychiatric associations didn’t commit suicide (figuratively, of course). But instead they chose to focus on their chemical tools..
To be honest, the more I read about psychiatry the more disturbing it becomes..